11/24/2016 11/24/2016 LetsPlayNintendoITA20 Comments on Happy Thanksgiving! and Returning items in the shop! Happy Thanksgiving! and Returning items in the shop! 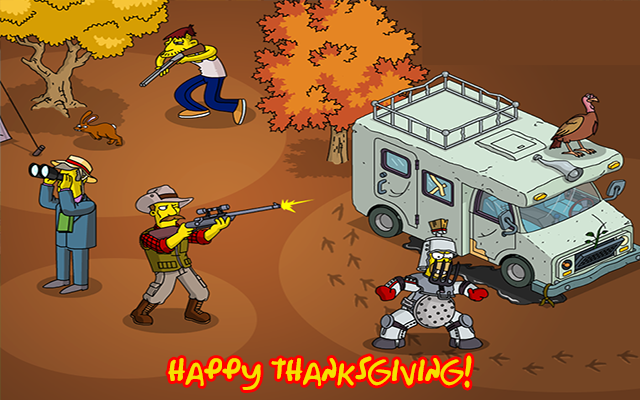 TSTOTopix would like to wish each and everyone of you a Happy Thanksgiving! EA also thought of that too, and gave us a free gift and some returning items in the shop. Join us right after the jump for all the infos! 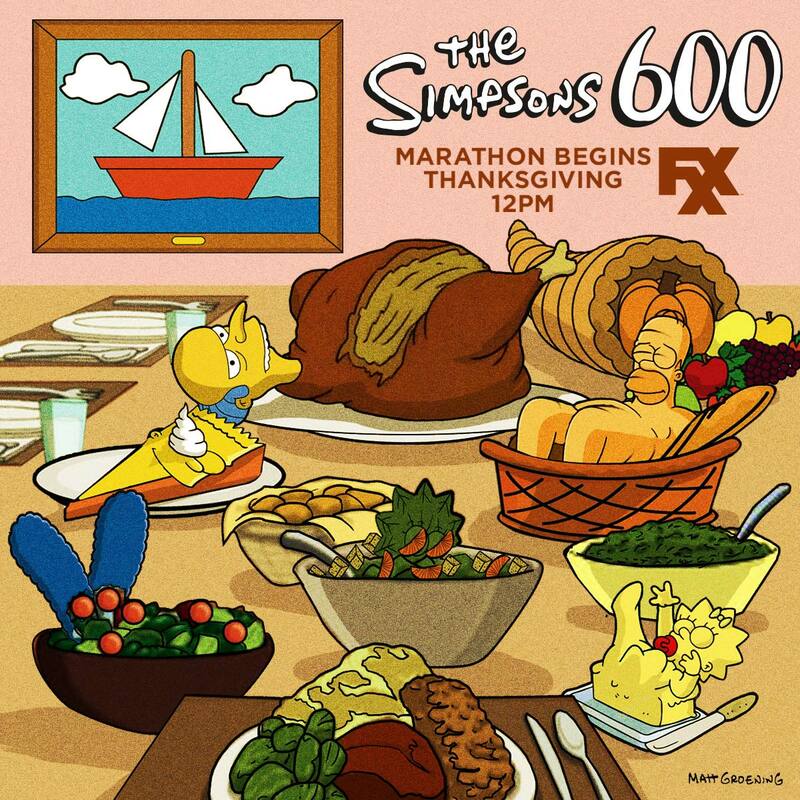 Don’t forget that today at noon ET, starts the The Simpsons 600 Marathon on FXX too! Fat Tony: Can I interest you in some Thanksgiving turkeys. In poultry industry jargon, they, uh, “fell off a truck”. Lisa: Wait, the robbery at the Kwik-E-Mart was you? And not Bigclaw? Fat Tony: Well, a guy in my crew messed his hand up in a roulette accident and now we call him Bigclaw. So the answer is both yes and no. That would confuse a jury, right? Lisa: These turkeys still have Kwik-E-Mart price tags on them! Louie: Looks like these turkeys are going swimming with cement shoes. But I’ll make it look like a scuba trip gone wrong. 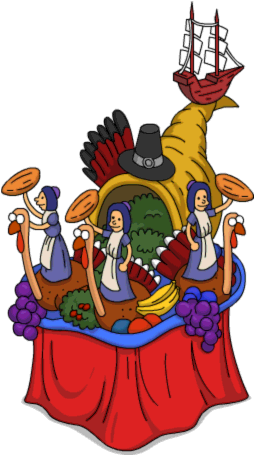 Not only we get a free Cornucopia item, but some returning items for Thanksgiving are in the shop now. Though be quick: all items will leave tomorrow, November 25th at 8am GMT! The 600th episode of The Simpsons aired October 16th, with the Treehouse of Horror XXVII special, and today starts the The Simpsons 600 Marathon on FXX to binge watch all the 600 episodes back to back! The marathon starts at noon EST, to conclude December 7 at midnight EST! king size homer Quotes – LETS IT ALL HANGOUT AT BENCH – why lock,only me or other? What message does it say? Did his quest start? What about black Friday deals? Black Friday came a day early! You’re right to say “Uh?” I misread the date. Yes,I obviously know that. I thought there might be a scoop. Another year and no Itchy or Scratchy balloons 😦 😦 I would have spent money on that! Will the marathon be aired by Fox Europe?